Oppppps .... Sorry, You can Check our home page & see the updates.. - GGI-Group size: 4000+ Professionals, Increasing on day to day basis, Come & join us 2 serve Mother Nature. Oppppps .... Sorry, You can Check our home page & see the updates.. Important Note : Please Lock u’r Cycles while u Park preferably with u’r fellow GGI’s Cycle. 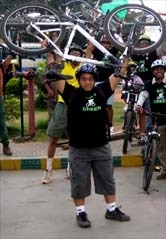 Dress Code : GoGreen T-Shirt ( U can click on this link) 2 know more about GoGreen Jersey..
We have organised Independence Special ride along with Waterstone. 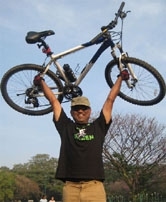 participate in our cycling event. Meeting point : Reliance I Store (RIS) Junction. 3) Lock u'r cycles while u park, preferably lock with fellow GGI-Cyclist. 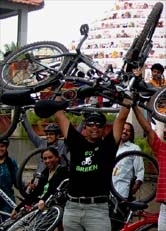 4) People who don't have GoGreen Tees can wear Black T-Shirts.